Bansalan is a 1st class municipality in the province of Davao del Sur, Philippines. In the lowlands of Mt. Apo lies the rural town of Bansalan. Despite its agricultural economy, it is one of the progressive municipalities in the province of Davao del Sur.Legend has it that Bansalan got its name from a Bagobo chieftain (datu) named "Dansalan" whose tribal folks were the original inhabitants of the place. A so-called reporting error by the early surveyors transposed the name to Bansalan and somehow became the official name on record. Bansalan is also formerly called Miral and some local folks still refer to this former name. Visitors to this rustic town would notice that in public transportation the signboard still says Miral instead of Bansalan. Bansalan is about 72 kilometers south of Davao City and is very accessible by land transportation mostly by buses going to Cotabato City, Kidapawan City, and Tacurong. 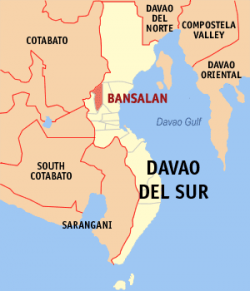 Bansalan is about 12 kilometers northwest of the capital city of Digos. Her neighboring towns include Makilala, North Cotabato in the north, Magsaysay, Davao del Sur (formerly called Kialeg) in the west, Matanao, Davao del Sur in the south, Mt. Apo and parts of Digos City in the east. The town of Bansalan is a second class municipality which means its income level is between 27 million to 35 million pesos. According to the 2000 census, it has a population of 51,781 people in 11,073 households. Agriculture is the major source of income for this town. Bansalenos grow rice, corn, banana, fruit trees, coconut, sugar cane in the lowlands. Coffee, vegetables and fruits are grown in the colder highlands of Mt. Apo. Bansalan is also keeping up with the times in terms of technology. It has access to cable television, computers, and cell phone sites. It may not be at par with the big cities but it's getting there. Gone are the days when radio was the only source of mass media communications. The humble beginnings of Bansalan trace its roots with its creation as a barrio of Sta. Cruz, and later of Digos in the once single province of Davao. Bansalan included in its original territorial claim the areas now occupied by the towns of Matanao and Magsaysay. Lush tropical rain forests used to cover the entire area so that the nomadic Bagobos, the aboriginal tribe, had to hack their way through the seemingly impenetrable growth of trees, vines and dense vegetation which had virtually become their vast hunting grounds. Once a primeval picture of tranquility, Bansalan cradled in its bosom the rugged hills and the verdant fields demarcated by rushing rivers. Some of these rivers found their tributaries from waterfalls cascading into deep ravines or from crystal-clear lakes that mirrored the skies against the noon-day sun. Such nature's picturesque gifts still exist to this day but are somewhat spoiled by the passage of time and man's incursions. Datu Mandu, the adventurous tribal chieftain whose fabled exploits were the first to be recorded in local history, established along the banks of the Miral River a village that grew rapidly during his time. His successor, Datu Tumunas, relocated the settlement of his people to the nearby patch of cogonal meadows where cultivation of plants and domestication of animals were started. It was Datu Tumunas who named the place Dansalan, after the valiant Datu Dansalan who ruled the tribe some decades past and whose legendary valor and chivalry were recounted through the next generations. It was said that visiting Americans, who were part of the team dispatched from Manila to oversee the development of the countryside during the Commonwealth times, arrived in the area and asked for the name of the place, to which a native replied, "Dansalan". The reply must have been misheard by the visitors for they used the term "Bansalan" in their report and the name stuck from then on. Bansalan, then a struggling barrio of Sta. Cruz and later of Digos, was actually called Miral in the record books, so named after the river that flows across the town from its watershed to the plains below. As more and more people from the different regions of the archipelago were lured to settle on this fertile stretch of land, the population steadily grew that its present culture has become a merry mix of the various cultural groups of the Philippines. On July 19, 1949, Miral became a barrio of Digos when the latter was created into a municipality. Less than three years later, Bansalan also became a municipality. President Elpidio Quirino, after having received a petition of the residents of Miral for the creation of their barrio to a municipality, penned Executive Order No. 506 on June 6, 1952, separating Bansalan from Digos as another independent town. On June 17, 1957, the municipality of Matanao was created out from the territory of Bansalan. Ten years later, on June 17, 1967, the municipality of Magsaysay was likewise created. The establishment of these two municipalities substantially reduced Bansalan's original vast area. The creation of Bansalan as a municipality in 1952 opened new positions in the municipal government. Apolonio Iligan, a captain of the Philippine Constabulary, took office as the first mayor on September 18, 1952 and this date has been celebrated as the foundation day of Bansalan. In November 1955, Ramon de los Cientos, Sr. handily won the elections and since that time on began his illustrious political career. His charisma made him win the mayoral elections two more times in 1959 and 1963. He was appointed as member of the Provincial Board of Davao del Sur in 1966 when Davao was divided into three provinces. A year later, he was elected as governor of Davao del Sur in a sweeping victory and thereby entrenching his hold on local politics. Vice Mayor Elvira Villamin of the famed Aquino clan of Tarlac, a physician before joining the world of politics, took the mayoral post vacated by De los Cientos. She ran and won the mayoral elections in 1967 and became the first and only female mayor of Bansalan. Atty. Arturo Gallardo (Liberal Party) became the next mayor in 1971. The declaration of Martial Law on September 21, 1972 suspended all forms of electoral exercise, thus, enabling Gallardo to hold the post for an extended term of eight years. In the local elections of 1980, De los Cientos made a political comeback and was elected once again as mayor of Bansalan for the fourth time. The historical People Power of 1986 snapped De los Cientos' stay in office as most incumbent government officials were replaced. Atty. Ernesto de la Cruz, De los Cientos' vice mayor was appointed as officer-in-charge. On September 29, 1986, De los Cientos was gunned down while attending a fiesta in Bonifacio, a barrio of Bansalan. De los Cientos who has been given the honorary title of "The Grand Old Man of Bansalan" was deservedly accorded a hero's burial. During the two-month campaign in the 1988 local elections, the first to be held after the 1986 Constitution was ratified, Mr. Romulo Nuyad acted as officer-in-charge of Bansalan after De la Cruz vacated the post. In the aftermath of this electoral contest, Gallardo was again chosen as mayor. In 1992 and in 1995, he repeated the same electoral triumph. Today, Bansalan occupies a total land area of 20,770 hectares. Its southern area covering 11,001 hectares or 52.97% of the total area is classified as alienable and disposable land while the remaining 47.03% northern portion is classified as national park for wildlife preservation. Bansalan has a young population with 67.5% belonging to the 0-29 age group. The 0-19 age group comprises 50% of the total population. Bansalenos are mostly Catholics (80.53%) but most of the other religious sects are also existing. About 87.73% of the residents are Visayans (Cebuano, Boholano, Ilonggo) although other cultural groups in the Philippines like Ilocanos and Tagalogs are also represented. The average temperature in Bansalan is 27°C while rainfall is more or less evenly distributed throughout the year. However, a pronounced rainfall is experienced during the rainy season from June to September of every year. Bansalan is politically subdivided into 25 barangays. Poblacion Dos} census, it has a population of 51,781 people in 11,073 households.